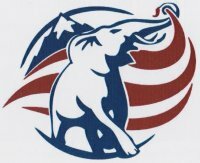 For those who have time, energy, and the passion to take our country back, volunteer to help your Republican Party accomplish our goals. There are many ways for you to help, see our flyer for some. Become a member. Dues are $20 per year. Associate members are $10. We meet every 4th Tuesday of the month at the Bailey Library, downstairs conference room, 12pm. Bring a sack lunch!